Looking more closely at these pics, they actually open up some questions. Bud ran the car in 1969 only, and I believe it always ran #31. 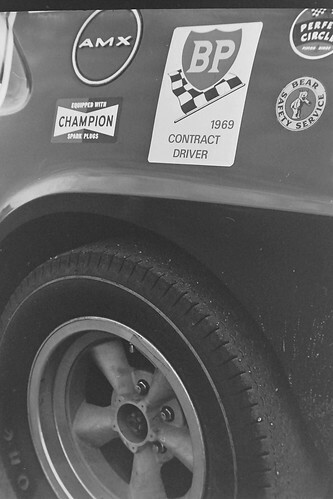 In the pics that Adam says are from 1971, the car wears #159. 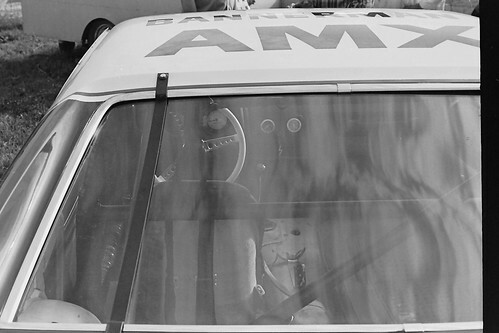 The story I have heard is that the car sat in Bannerman's shop during the 1970 season. In 71 it was apparently run by someone else, but nobody seems to remember who. Following the 71 season, the car was relegated to the lot behind the dealership and at some point the race prepped 390 found its way into a tech's street car. It would be interesting to learn more about the 71 season. There are some pretty cool ads featuring Camaros as well. More Paul Gulde images of my Dad - this time at Harewood Acres. This is awesome! Thanks, Mike, for starting the… wait for it…Express of ideas and photos that led to Robert inviting Grant. Grant, thanks for coming over. I've never seen that ad. It is cool. If his site isn't defunct, a fellow known as Arctic Boy would love to include that in with his AMC memorabilia. The interesting car I see in the ad drawings is the one to the left of, and directly below, The Doug's Header's funny car Javelin. It looks like a cross between a Camaro and a '70 AMX or '71 Javelin. It is also interesting that dealer is in Brampton, Ontario. That was the location of a major AMC factory and engine plant if recall is accurate. True, but that car was set-up way different than the TA cars. Craig could probably add to that. 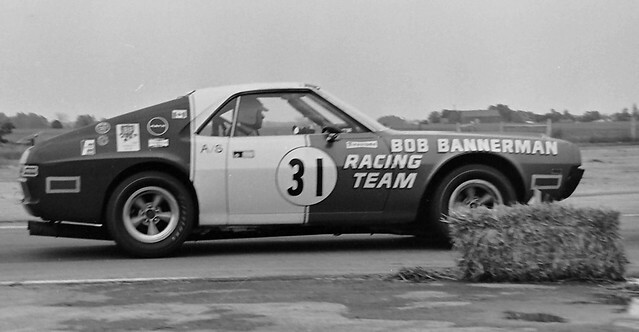 There is a Redliner newsletter put out by AMC back in the day that a Mr. Thomas Benvie, SS/AMX historian, from Massachusetts posted on an AMC site that mentions the RKE ( Ronnie Kaplan Engineering/ Inc.) running a three car team in '69. Unfortunately it looks, so far, that the #33 Javelin, a '68 car, might be that third car. I was hoping there was comfirmation that the Dewar car was that third car. More research is necessary. I was told years ago that Gordon Dewar's Javelin from '69 was a Kaplan built car but I have not looked closely enough at it to see if it was constructed in the same fashion as the RKE cars. Excuse me, I didn't notice that it is Gary Grant, not just Grant. I don't have any of my books or pictures handy, but I don't think that I ever came up with a 100% idea on the Don White #2 car. Obviously, he/it didn't run, as #2 was Ford/Revson, right??? Last summer, my brother and I spent several hours with Ronnie Kaplan, and I think we even overwhelmed him with all of our info and pictures. Back in the day, magazine articles etc listed 'customer cars' and such at RKE....too bad that was over 40 years ago. I'll say this, that Dewar Javelin has rear flares that look an awful lot like RKE 69 T/A Javelin. And I agree with Steve....the 'third' 69 team car was one of the leftover 68 cars (Follmers or Revsons). Mike, thank you signing up for our forum. It is always a pleasure to learn more about these cars from that great era of the late '60s and early '70s and a privilege to own one of them as well. Hello, Mike. Welcome aboard. I'm currently working behind the scenes on the request you posted for more information on the 66 AMX. When I get some solid feedback from the source(s) I'm going through I'll post here or hook you up with the information. to, naturally, as the #47 Dewar Javelin. Yet, when one goes here:http://www.racingsportscars.com/type/results/AMC/Javelin.html and one goes to the 1969 results the connundrum presents itself. 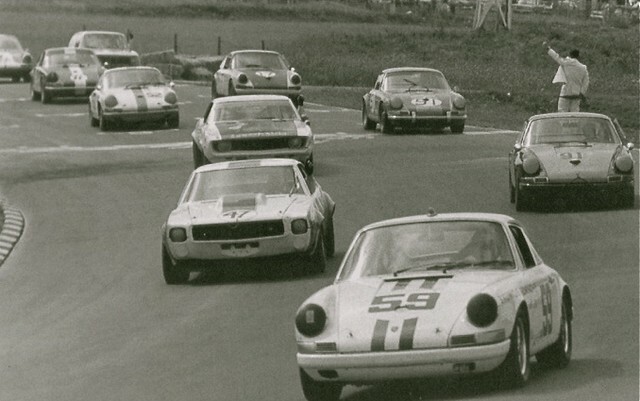 Check out the entries for the St.Jovite race on August 3rd of 1969 and then check out the entries listed for the Watkins Glen race on August 8th. See the problem? The discrepancy needs deconfliction. Steve, that picture you posted is not from St. Jovite, it is from Watkins Glen. The cars in the back half of the photo are crossing over the marked grid locations and the start/finish line and the cars in the front are going through the first bend. Definitely Watkins Glen. Gordon Dewar did not race at the '69 St. Jovite race, for some reason. At Watkins Glen, Ron Grable was driving the #4 RKE Javelin because the #3 Javelin had been heavily damaged in the 8-car pile up the weekend before at St. Jovite. John Martin had broken his arm in a garage accident and Lothar Motschenbacher was not a favorite of Ronnie Kaplan's. Hence, Ron Grable made the move from the #3 to the #4. Awesome. That narrows down the potential confusion as well as pinpointing that the number 4 car and the number 47 cars cannot be one and the same at the same race. The number 4 car is out of the picture, and the number 3 car is separate and distinct from the number 47 car at the same race. Now, finding a photo of both the #'s 55 or 33 at this race will help. Then it is left up to contacting Dewar ( is he still alive? ) or someone else familiar with JNO Racing Enterprises Ltd.which was described as being in a converted grocery store location in Hull( across from Ottawa ) Canada at the time (1971) by photographer ( then - Ottawa Baby Photographers ), Allan De La Plante.